When the Castlevania series first debuted, credit was given to Vampire Hunter D, a series of Japanese novels (and two movies) about a vampire hunter going up against Dracula. We'll begin our discussion of movies and cinema with reviews of both Vampire Hunter D flicks (and maybe one day we'll get ahold of English copies of the books and review those, too). 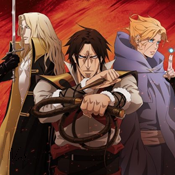 But the connection between the Castlevania series and cinema isn't limited to two anime movies and its own TV show. The series has long shared ties to classic horror cinema, parodying both the Universal and Hammer films series from the very first game onwards. Over time, the connection has grown deeper, borrowing ideas and characters from horror cinema to give the series a greater connection to its cinematic ancestors. Throughout this section, we'll take a look at the classic monsters of the silver screen. It's our excuse to watch movies and call it an assignment for the site. And since the modern age of horror keeps chugging onwards, we'll continue to add movies and television shows into this section as well. Anything that seems vaguely applicable (such as vampires, werewolves, and abominations of science) will get included in this section. Like Caastlevania, these films are informed by the classics that came before but have also served to influence our current views and expectations of the classic monsters.